A hot bowl of soup or chili is great—except when it's too hot to take out of the microwave! Solve that problem with a handmade potholder designed to go in the microwave along with the bowl. You can grab your heated food and enjoy it right away. Here you'll find several styles and sizes of bowl cozies, plus a few other items to keep your food warm and your microwave free from food splatters. The secret to making these bowl holders is to work with 100% cotton fabric, batting, and thread. Using polyester can result in melting or even fire in your microwave. 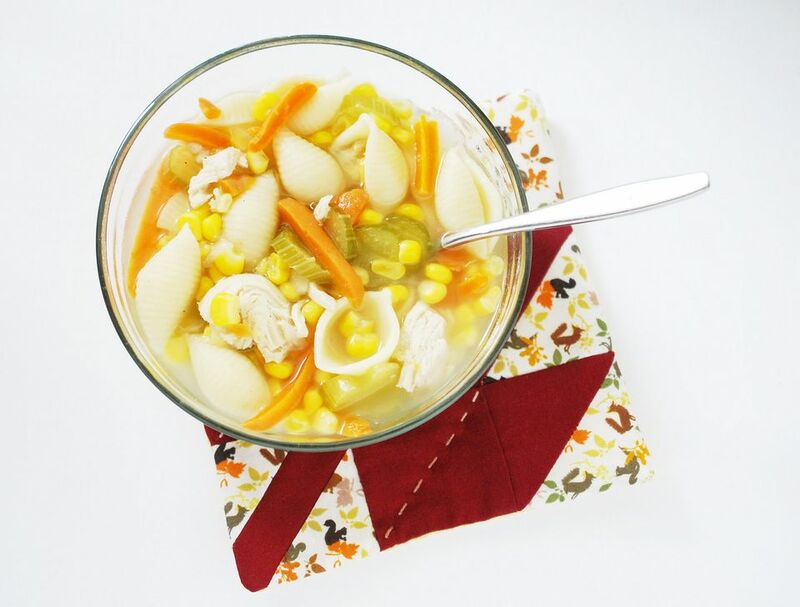 Get ready to enjoy some leftovers and start sewing a bowl cozy or two! Sew a whole stack of cozies in a hurry with this easy tutorial for microwave bowl potholders. When you sew them in batches, it takes less time, which is perfect for making gifts or preparing to serve soup or chili to a crowd! This free tutorial shows you how to make a bowl cozy with a different shape from many you'll find. The tabs make it easy to grab your bowl out of the microwave and they look cute too! Nobody likes a messy microwave! Save yourself some cleaning time with this splatter guard. It's just the right size for covering a bowl of soup or other leftovers as they reheat. Plus, it's designed to work with fat quarters, so you can head to your fabric stash to get started! From individual soup bowls to larger serving bowls, this pattern from Indygo Junction protects your hands from hot dishes. The three sizes nest together for storage and all three come in the PDF or printed pattern. And they're so cute that you can even leave bowls in them on the table! Unlike many of the projects in this list that keep your hands cool, use this casserole carrier to keep your food warm! It's designed for taking a hot dish to a gathering or to a friend in need of some extra help. But you can also use it to help keep your meal warm as you wait for everyone to come to the table or as other food items finish up. Just remember not to place this one in the microwave if you use the recommended Insul Bright batting. For microwave use, switch to all cotton materials. If you've never tried the quilt-as-you-go method of quilting, this potholder is a great first project. The quilted and pieced side also becomes binding for the edges, then the corners sew together for the shaping. You could also make this without the quilt-as-you-go method with a few easy adjustments. 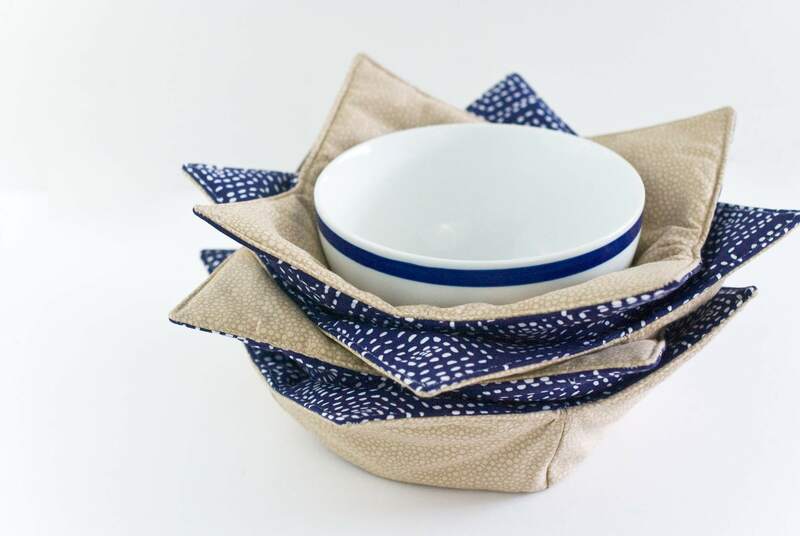 The idea behind these "warm pads" is like the bowl cozies throughout this list, but instead of shaping them like a bowl, they stay more like a potholder. They begin with a favorite quilt block (use a leaf as shown, or another design you like), then get hand quilted with cotton batting. Remember, any of these bowl holders are good for holding a hot dish from the microwave, but you shouldn't use them for pans hot out of the oven! Designed to keep dishes (or teapots!) warm, this rice-filled trivet also smells nice! As the trivet warms, the rice releases the scent of whatever essential oil you'd like. To use it to keep dishes warm, pop it in the microwave first. Or, if you don't fill it quite as much, you can use it to hold your bowl or plate as you take in the enjoying aroma of food and a complementary scent! There are so many shapes and options for a bowl potholder, and this hexagonal-shaped bowl cozy is another beginner-friendly pattern that shows off a fun fabric with a bit of quilting. Don't want to make your own? Belaire Village also sells finished bowl cozies!